Maria's Stamping Station: Final Stampin' Up Video for the Week and Stampin' Up Contest soon to end! Final Stampin' Up Video for the Week and Stampin' Up Contest soon to end! Here's the final video for the week. 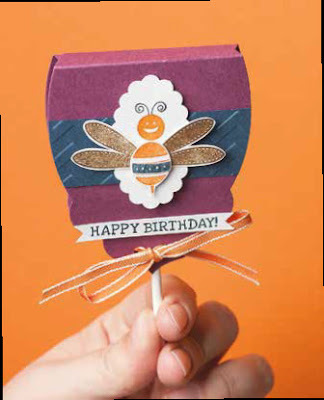 This video features Carrie Cudney showing you how to make the adorable lollipop cover on page 84 of the 2013-2014 Annual Catalog. I think all my email subscribers know by now, but just in case, I wanted to remind you that you'll need to click over to my blog in order to view the video. And hey, if you've enjoyed this week of videos, let me know; leave me a comment when you have a minute. And don't forget about the Stamp Set Design Challenge-the first round is soon to end! Stampin' Up has created a way for you to help us design and choose new stamp sets—In with You (beta program). The In with You program is currently open to anyone in the United States and Canada, including District of Columbia, APO/FPO, and Puerto Rico, but not Québec. Once you join our In with You online community, you can submit your original artwork for stamp set challenges, vote and comment on other people’s submissions, earn badges, and interact with others in the community. We will produce and sell one or more stamp sets from among the top-voted submissions in each challenge. Plus there are fabulous prizes for top designs! Submit ideas early so you have plenty of time to gather support for your work (you know—get your friends to vote for your design). They say, “Be careful what you ask for.” We say, “Whatevs!” We’re looking for the best monster images for cards, scrapbook pages, and other craft projects. Show us your best hair-raising, spine-chilling, terrifying creatures. Or maybe you’re more comfortable with monsters and creatures in the cute category. We like those too! So muster your courage and submit five to ten images of your original artwork. Your images may be the next great stamp set! For more information, submission guidelines, terms and conditions, and to participate, go to http://inwithyou.ideascale.com.